Welcome to the complete guide to ALL Key Item locations and puzzle parts in Resident Evil 2 Remake on PS4. 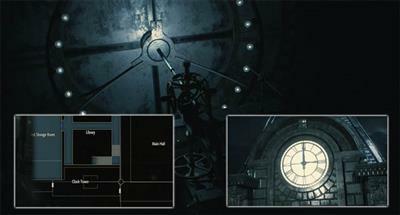 This reference guide contains the exact map locations for all of the games important items which are essential for solving puzzles and opening locked doors. In this guide you will find, among other things: locations for the 3 medallions, ALL key locations (Spade, Club and Diamond), keycards, bolt cutters, electronic parts, batteries, detonators, jewels and other tools. Basically, this list will give you precise building, floor and room locations for everything you need to complete the game. There will be minimal spoilers, minimal character references and no boss fights. Given the vast size of the police department, the majority of the games puzzles and items are located there. Players should note that items are not always what they seem in RE2. The Examine option in the inventory screen should be used frequently to inspect (and rotate) items to uncover their true purpose. For example, the Bejeweled Box is a simple box before it's examined and rotated. The Combine menu option also plays a vital role, allowing players to mix two items together and produce something more elaborate. A good example of this is the Detonator which is constructed from an electronic part and a battery. The list below will help to explain what each of the items are used for in the game. Once a Key Item has served it's purpose, players can discard the item from their inventory to reclaim space. Police Station 1F, Main Hall. Solution is: Lion, Twig, Eagle. Police Station 3F. On top of the table in the corridor. Police Station 2F, Lounge. Solution is: Fish, Scorpion, Aquarius. Police Station 2F, Art Room. On the small table near the statue. Police Station 1F, Fire Escape. This item is only available after progressing through the east wing of the 2nd floor Police Station. A helicopter crashes and then after the cutscene the Cutting Tool is on a rubbish bin in front of you. Police Station 1F, East Office. Enter the East Office using the Cutting Tool on the door. Use the Round Handle in the Shower room (where the steam blocks your path) on the 2nd floor. Police Station 1F, East Office. In the middle of the office on the table. This part can be used to open the door that leads back to the central main hall. Police Station 2F, S.T.A.R.S. Office. To get here you need to use the Round Handle (above) on the Shower Room on 2nd floor to turn off the steam that's blocking the path. Police Station 1F, Operations Room. Use the Cutting Tool to cut open the door in the south of the Operations Room. The Electronic Gadget is behind the door. Open your inventory and combine the Electronic Gadget with the Battery to make a Detonator. Use detonator on the 3rd floor, West Storage Room, to blow up the C4 barricade to get 3rd Medallion (Maiden Statue). Police Station 3F, West Storage Room. Use the Detonator on the C4 to explode the barricade. Then enter the statue combination of: Woman, Bow, Snake. Police Station B1, Jail. On the table by the file. Police Station B1, Morgue. Open the morgue freezers, the key is on one of the corpses. Police Station B1, Generator Room. Collect the Boxed Electronic Part and examine it to unbox it, this gives you 1 of 2 Electronic Parts. Use these parts on the Electronic Door Panel in the Jail. Police Station B1, Firing Range. Collect the Box and examine it to open and reveal the Car Key. To use, examine the car key to press a button on it when the car is nearby. This opens the trunk to reveal a weapon upgrade. Police Station 1F, Break Room. In plain sight on a chair. Police Station 3F, East Storage Room. Right in the middle of the room. This part is used in the Clock Tower. Police Station 1F, Boiler Room. This area is only accessible to Leon and NOT Claire. You reach the Boiler Room after passing through the roof. Police Station 2F, Library. In the Library near the exit to the Main Hall. The Red Book is used to get the Red Jewel from the one armed statue. Police Station 2F, Art Room. A series of steps required to ultimately get the Red Jewel, required later for getting the USB dongle for the STARS Office computer. Combining the Arm with the Red Book creates a new part which can be inserted into the one armed woman. This reveals the Scepter which when examined releases the Red Jewel. Police Station 1F, Observation Room. 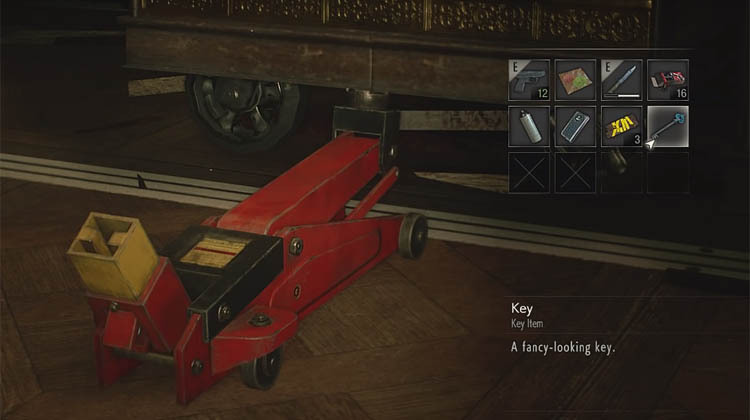 Go down the stairs from the Art room and use the Green Key (or Red Key with Claire) to unlock the Observation Room. Pick up the Bejeweled Box, examine and combine with the Red Jewel to unlock the box. Examine the new Police Badge to reveal the USB Dongle which can be used in the STARS Office to unlock the Armory room and the Magnum (or Submachine gun for Claire). Police Station 1F, Record's Room. You can use the Tool on the Jack in the Library 2nd Floor to move the bookshelves and thus reach the Clocktower. Police Station 3F, Clock Tower. Use the Large Gear (from East Storage Room) on the Gear Box in Clock Tower to reveal a staircase. Go upstairs, swap the Small Gear for the Large Gear. Go back downstairs and put the Small Gear in the console which drops the Boxed Electronic Parts. Examine and open for the Electronic Part. Using the two Electronic Parts, return to the Jail (Police Station B1) to solve the Electronic Door Panel Puzzle. Police Station B1, Jail. Found on Ben's Corpse. Sewers (Middle), Treatment Pool Room. Near the cable car on a box. Sewers (Lower), Path to Bottom Waterway. The T-Bar Valve Handle opens the door to the Bottom Waterway, before climbing down the ladder, collect the key from the wall. Sewers (Lower), Supplies Storage Room. The two plugs are used to open the weapons locker and then later to open the U-Area Door in the Monitor Room. Sewers (Upper), Hallway between Workroom and Worker's Break Room. Now that you have all three plugs, return to the Monitor Room on the Middle Sewers. Three plugs are there already and you need to add your three. The solution is: Left Wall = Bishop + Rook + Knight / Right Wall = Pawn + Queen + King. If done correctly, this will open the U-Area Door. Laboratory, Nap Room. From the Cafeteria, climb up to reach the Nap Room. Pick up the Electronic Chip and combine with the ID Wristband (see below for Wristband) to create a special key. Now you can open various doors in the Lab. Laboratory B1, Room south of Lobby. On the wall in a switch box. Laboratory B2, Low-Temp Testing Lab. Place the Cartridge in the Freezer to turn it into the finished Herbicide. This can then be used in the Control Room. Laboratory B1, Greenhouse. Put the Cartridge in the Control Room and wait for the plants to die. Collect the Electronic Chip from the dead scientist by the window and combine it with the ID Wristband to upgrade to the Senior Staff level.